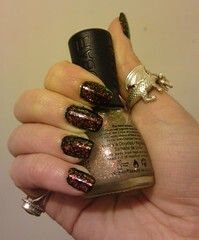 I took the leap of buying some Nubar polish. Two coats of the Rimmel top coat as the extra coat gives a very glassy look to the polish. You have no idea how hard it was to get a good picture of this polish.